The Rochester Institute of Technology (RIT) is holding an on-campus event on Sept. 13, open to the public, to showcase augmented and virtual reality (AR/VR) projects and digital performances created by faculty and students. The Frameless Labs Festival @ LSI is organized by RIT’s Frameless Labs, a campus group that brings together AR/VR research, innovations and artistic creations. It is part of the three-day expo Light and Sound Interactive 2017, which highlights light- and sound-based technologies and applications, according to a university statement. Participants will be able to see and try hands-on experiences with augmented reality, virtual reality and digital performance. 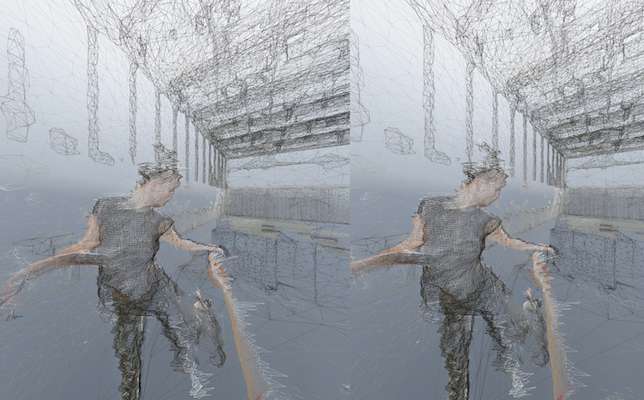 A VR experience and interactive website titled “Dust,” for instance, challenges individuals to delve into contemporary dance from the perspective of a particle traveling in space. “It explores the boundaries between the virtual and the real-world experiences and advances research in the fields of participatory performance, human-computer interaction and VR technologies,” the project page explains. "Dust" is one of the projects that will be on display at the free Frameless Labs Festival at RIT on Sept. 13. Image: RIT. Another featured project is “Kingdom of the Tao,” which took first place at the RIT-hosted New York State Game Development Challenge in the student category. The VR educational game aims to deepen the player’s mind-body connection through practicing Chinese Kung Fu and Tai. “Mur—A Step-in Book,” an interactive app for the Finnish children’s book A Bear called Mur, will also be highlighted at the festival to demonstrate how AR can enhance storytelling. On the side of performance arts, “Farewell to Dawn” is a mixed-reality dance performance made for Oculus Rift that explores two dancers’ journeys from a physical space to a virtual stage and back. “VR and AR are frameless mediums and open the window to a limitless sort of applications for science, education, content creation and many more,” according to the Frameless Labs Facebook page. The event is free and taking place on Sept. 13 from 7-9 p.m. at RIT’s Student Innovation Hall.